Patients with sickle cell anemia (SCA) have an increased prevalence of nephropathy and mortality from chronic kidney disease (CKD). We evaluated the association of hyperuricemia and nocturnal hypertension with lower estimated glomerular filtration rate (eGFR) using cystatin-C in patients aged 10–21 years with the HbSS or HbSB0 form of the disease during a non-acute clinic visit. eGFR and uric acid measurements were obtained in 83 and 81 participants, respectively, and 24-h ambulatory blood pressure monitoring (ABPM) was performed in 44 participants. Annual testing included vital signs, complete blood count, comprehensive metabolic panel, medications, urine microalbumin/creatinine, and lactate dehydrogenase measurements. Hyperuricemia was defined as a uric acid level of ≥5.5 mg/dL. Nocturnal hypertension was defined as >25% of nocturnal readings at >95th percentile according to norms established by the American Heart Association Statement on ABPM in children and adolescents. The mean eGFR was statistically significantly lower in patients with hyperuricemia than in those with normal uric acid levels (143 vs. 161 mL/min/1.73 m2, respectively). Of the 44 participants for whom ABPM data were available, 14 (32%) had systolic nocturnal hypertension and 12 (27%) had diastolic nocturnal hypertension. The mean eGFR was statistically significantly lower in participants with nocturnal systolic and diastolic hypertension than in those with normal nocturnal blood pressure. In a regression model, nocturnal hypertension and hyperuricemia were associated with a lower eGFR. Two risk factors for CKD, i.e., nocturnal hypertension and hyperuricemia, were associated with lower eGFR in older children and adolescent patients with SCA. Long-term studies on their association with progression to CKD in this population are warranted. Nocturnal hypertension and hyperuricemia are established risk factors for nephropathy in other diseases and may play a role in SCA nephropathy. The online version of this article (doi: 10.1007/s00467-017-3658-8) contains supplementary material, which is available to authorized users. The authors would like to acknowledge Children’s of Alabama/ Kaul Pediatric Research Institute for funding the initial participants in the cross-sectional study and the NIH (K23HL127100-01) and American Society of Hematology Scholar award for funding the ongoing cohort. The authors would like to thank the participants living with sickle cell disease that are volunteering for this study. The authors would also like to thank the additional members of the Pediatric Sickle Cell team (Lee Hilliard, Christina Bemrich-Stolz, Kristen Osborn, Susan Dobbins, Heather Carlton, Michelle Alleman, Jeanine Dumas, Amelia Jantz, and the SCA clinic nurses) for providing excellent care and assisting with obtaining the laboratory data. The authors would like to thank SCA research interns Kavita Tripathi, Hannah Ware, Rakesh Patel, and Prasannalaxmi Palabindela for assisting in performing 24-h ABPM. 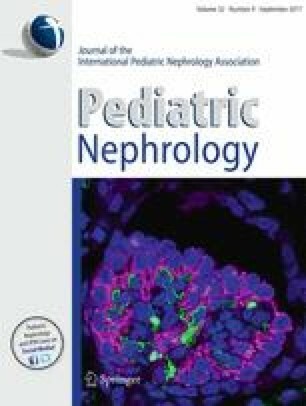 The Institutional Review Board at the University of Alabama at Birmingham (UAB) approved this study of the evaluation of risk factors for the progression to sickle cell nephropathy and written consent and assent was obtained from every parent and child enrolled. JL wrote the first draft or the manuscript. All five authors participated in editing the drafts of this manuscript. PM, GC, and DF assisted JL in the design and analysis of the manuscript and serve as primary mentors for JL’s K23 award and TH serves as an advisory panel member. GRC discloses the following: (1) participation in Data and Safety Monitoring Boards, as follows: Apotek, Biogen-Idec, Cleveland Clinic (Vivus), Glaxo Smith Klein Pharmaceuticals, Gilead Pharmaceuticals, Modigenetech/Prolor, Merck/Ono Pharmaceuticals, Merck, Merck/Pfizer, Neuren, Sanofi-Aventis, Teva, Washington University, NHLBI (Protocol Review Committee), NINDS, NICHD (OPRU oversight committee); (2) participation on Consulting or Advisory Boards, as follows: Consortium of MS Centers (grant), D3 (Drug Discovery and Development), Genzyme, Jannsen Pharmaceuticals, Klein-Buendel Incorporated, Medimmune, Novartis, Opexa Therapeutics, Receptos, Roche, EMD Serono, Teva pharmaceuticals, Transparency Life Sciences. GRC is employed by the University of Alabama at Birmingham and President of Pythagoras, Inc. a private consulting company located in Birmingham, Alabama.